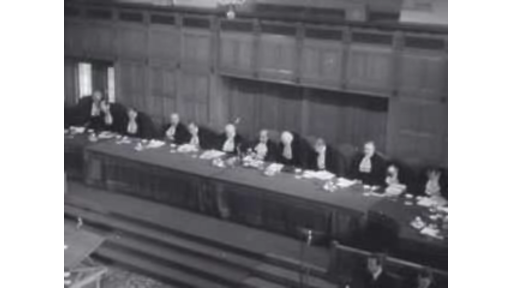 The International Court of Justice meets in the Peace Palace in The Hague for the first trial after World War II. The dispute between Great Britain and Albania is handled. This begun when two British cruisers hit mines in the Channel of Corfu on October 22, 1946 and sank. The English government blames Albania and demands a compensation. SHOTS: - ext. and int. of the Peace Palace; - int. courtroom: judges enter and/or leave while all the present people stand up; - medium shots of the central figures during this trial: President of the Court J.S. Gustavo Guerrero; English council Sir Hartley Shawcross;Albanian coucil Khareman Ylli, altenrated with shots of the other judges and present people.